By margreet riphagen, May 28, 2009 at 9:25 am . 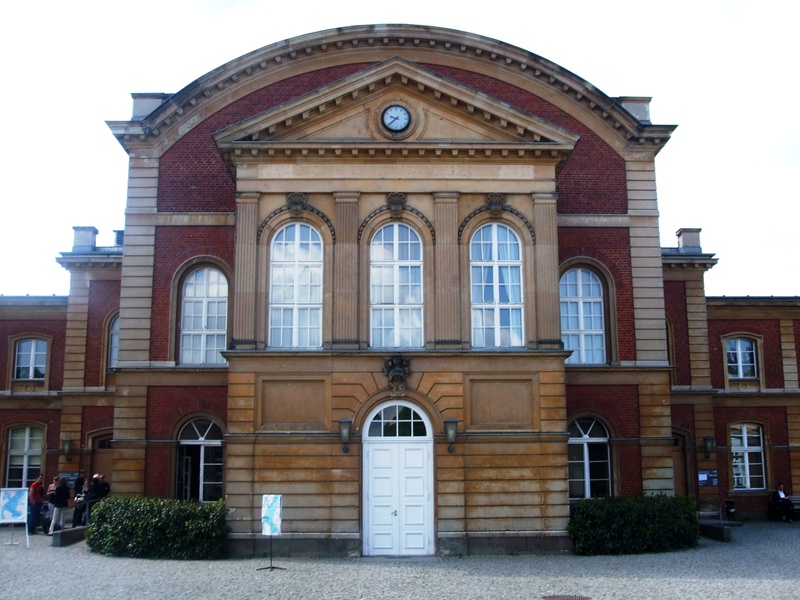 On May 21 2009, 15 media theorists and philosophers from Germany, Hungary, the United States and Canada gathered in Potsdam’s Am Neuen Palais (Germany) for an international conference on different perspectives, approaches and traditions in media theory. Media Theory on the Move was organized by Dieter Mersch, chairman of Media Studies at the University of Potsdam, his colleagues at EMW (Europäische Medienwissenschaft Department of the University of Potsdam), and four esteemed MA students, sponsored the Fritz Thyssen Stiftung für Wissenschaftförderung. For three days (program), a divers array of media scientists, theorists and philosophers had the pleasure of discussing their perspectives on media and mediation. Though the presentation titles ranged widely, from Joachim Paech’s ‘Popular Fiction, Popular Art and New Media: On the Way to Medienwissenschaft in 1970’s Germany’ to Peter Bexte’s ‘Prepositions and Things: Some Reflections on Relations’, the theme of movement continued to be the Ariadne’s thread throughout the conference. The constant motion of space and time surrounding our media landscape, coupled with our movements of thought on understanding media (ourselves and the world), turned out to be a challenging theme for discussion. It generated a heterogeneous debate including topics on the movements of interactivity, images, things, the symbolic, communication, time and contingency. 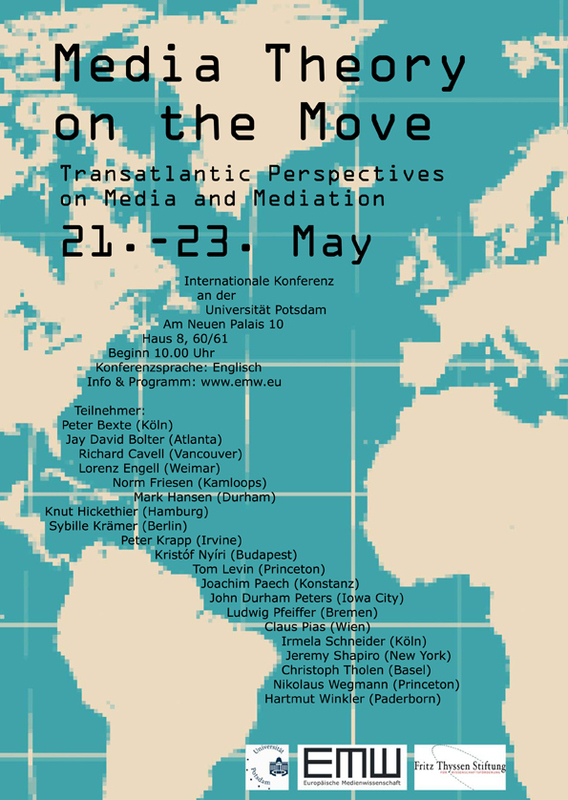 In a challenging exploration of the problems floating through transatlantic media theory, philosophy and practice, ‘Media Theory on the Move’ prompted a creative and critical space-time to further develop discussions on the movement of movement. After a short introduction by Dieter Mersch, the conference was officially set in motion. Jay David Bolter (Atlanta) followed suit with his presentation on the movement of interactivity in which he focused on the performative character of digital media. Predominantely drawing on examples of the DPI (Digital Performance Initiative of which Bolter is a faculty member), Bolter argued that in order to explore questions of liveness, presence and aura in digital media environments, we need to understand digital media as performative. The performative, as defined by Bolter, is the reciprocal correspondence of between procedural interactivity (interactivity as code) and intersubjective interactivity. While Bolter’s definition enables us to address the politics of interactivity and liveness, it became evident in the discussion that such a definition of the performative would need to be refined in order to address the aesthetic-ethics involved in interactivity. Unlike Bolter, Ludwig Pfeiffer (Bremen) and Sybille Krämer (Berlin) took on a more ethic-aesthetic perspective. Pfeiffer used a psycho-analytical approach to concentrate on subject-object relations of interactivity in the virtual. He argued that we need to dissolve historical myths (or ‘mentalities’) of comparing Japanese and Western aesthetics to understand ‘objectuality’ (i.e., sociality with an object) of interactivity. As opposed to Bolter and Pfeiffer devotion to interactivity, Sybille Krämer sought to develop a new kind of media theory. Or what she called: ‘a non a-priori and in-between media theory’. For Krämer, media do not represent something, but make something present. They are heterogeneous messengers that always interrupt the logic of transmission (i.e., they create links through the co-existence of difference and distance within the body of the messenger), and always reveal something: a way to look at the world. Media should therefore not be studied ontologically, but in terms of the mobilization of messengers in the in-between. Following the lunch break, Kristóf Nyíri (Budapest) discussed the movement of moving images by addressing the negligence in German and Anglo-Saxon traditions to pay attention to the mobility and dynamics of media images. That is, how ‘images are on the move between devices’. This mobility of images, Nyíri argues, helps to orient ourselves within environments, but also blurs the differences between the image and the real. Whereas Nyíri stressed the movement of images in space, Hartmut Winkler (Paderborn) explored the reciprocal process of the symbolic as spatialization and temporalization. In his talk Winkler presented a cyclic model of the geometry of time: a model where a ‘points in time can emerge on the plane (of eminence) and turn back in points in time’. His rather technical model explained spatialization as process and transmission, and temporalization as stasis. In the discussion Winkler’s geometry of time was criticized of being a too narrow description of the flow of information. It was argued that presenting storage as stasis left the information retrieval process (i.e., storage as movement) connected to storage out of the picture. Although Thomas Levin (Princeton) was supposed to present his paper on ‘Cinema and Surveillance’, he chose to take on a different route: to construct media historical analysis of datamoshing. For those unfamiliar with the datamoshing concept, datamoshing is the ‘haunting of one image by another image’ (Levin). It is the unique mashing of frames by removing keyframes (i.e., iframes). When those keyframes are removed only the modifications of the missing keyframes remain. Levin demonstrated how datamoshing articulates the need to invent a new understanding of media theory and philosophy that embraces this and similar media aesthetic-theoretic movements. Drawing on works of Sven König and David O’Reilly, Levin argued that datamoshing aesthetics as readable pixel manipulation provides a ‘sensory retooling’: the errors or pixel manipulations do not reveal the medium, but it is only through malfunction or disruption that the compression technique becomes readable. Because in the digital tactility has changed into information, it requires an adjusted perspective in order to make sense of the digital. The heterogeneous presentations of the first conference day raised several questions from the participants and the welcoming dinner provided the opportunity to extend the debate and/or socialize with transatlantic or local colleagues. With this informal social gathering, the first conference day was closed. The second conference day started off with Christoph Tholen’s (Basel) presentation on media and mediation as inbetweenness. Tholen demonstrated how media explores the concepts of space, time and image by tracing the metaphorical aspects of space-time relations in inter-mediality. For Tholen, the concept of the metaphor marks the indifference between presence and absence. This means that we presume a loss of subjectivity through the ‘metaphorization’ of media. Such metaphorical understandings of digital media as universal machines of transmission without substance accept and preserve an as-if relation between space, time, and image. It reconceptualizes life as ‘a metaphor of metaphors’. Whereas Tholen reconsidered fissures of space and time and the movement of metaphors, Lorenz Engell (Weimar) closely examined Jacques Tati’s work to ‘understand the material practices that make thought possible’. He interprets cinema as an intermedium for exploration through which we can examine different topologies of matter. By emphasizing Tati’s play of things (i.e., how objects are related to other objects, and how this play of things articulate space and time), Engell delineates that the playability of materials in moving images points at the ways in which we make sense of the world and ourselves. It should be noted that he described the materiality of things in the linearity of time, thereby neglecting the potential conflicts of time. Like Tholen, Mark Hansen (Durham) stressed the need to rethink the image to understand ourselves. He gave insight in how we need to move from the visual to the temporal by articulating time and image relations. According to Hansen, both the brain and images should be conceived as being dynamically temporal. In order to overcome the mental-material image divide (i.e., the gap between neuroscientific – mental – images and phenomenological – material – images) and the idea that thought is static, Hansen introduced the concept ‘neural binding’ (i.e., neurons within different neural assemblies are dynamically connected in time). This concept illustrated that images are irreducible temporalities. Because media ‘captures the time matter of images’, an additional temporal dimension (or ‘microtemporal binding event’) is added to the image. What has changed is not perception itself, but our access to perception. Though Hansen’s understanding of time and media might enable a more direct relation between the brain and images, he was criticized for taking a too ‘absolutist’ approach to time. His approach tends to disregard the connection between space and time. 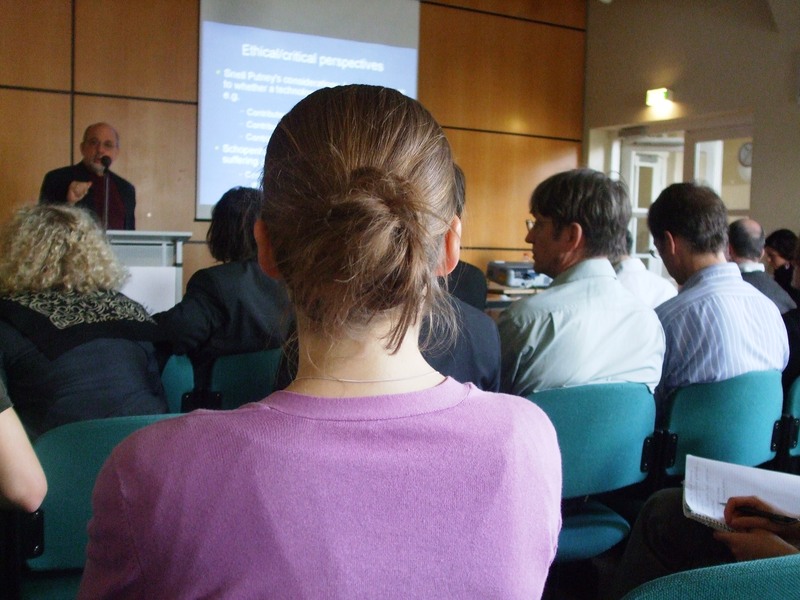 Also see the blogpost from Geert about ‘Debating German Media Theoery in Siegen‘. Taking a radical different approach and perspective than Hansen, Norm Friesen (Kamloops) compared German and Anglo-Saxon texts on media theory. He explored theoretical concepts of media pedagogy, such as mediatization and mediality, to demonstrate how these thoughts are explanatory of and embedded in socio-cultural contexts. By outlining the dissimilar approaches and understandings on the effects of media on education, Friesen emphasized the necessity and importance of mediatized education. This mediatized education should pay special attention to the peculiarities of media (in particular to the materiality and technicality of media) and constructing a merged media-pedagogical perspective. Akin to Friesen’s call for an integrated media-pedagogical view, John Durham Peters (Iowa City) outlined a proposal for generating a ‘transatlantic’ media theory. His thorough analysis of Mumford’s ‘Technics and Civilization’ traced the alliances of the United States and German in terms of communication and intellectual access. Mumford’s polymathic and ecologic approach, Peters argued, could be of use for imaging a transatlantic media theory. Three ingredients, then, are needed for such a theory: better intellectual communications, more people would have to learn German, and more translations are needed. Claus Pias (Vienna) took the theme of this conference to rediscuss the debate (at the University of Siegen) on the Germanness of German media theory. This debate revolved around, what Pias interprets as, the misconception that such a thing as ‘Germanness’ exists. Rather than recapitulating ‘the symptoms and causes of German media theory’, he shifts our awareness to the question of why we are discussing this ‘Germanness’ of German media theory in the first place. In other to understand why this recent debate emerged, Pias pursued three paradoxes and illuminated these using Fassbinder’s ‘The Third Generation’ (Fassbinder, 1979). First the paradox that media theory is a discipline. For Pias, media theory is not a discipline because of its heterogeneous and non-autonomic character. It questions both its methodology and its object of study. The second paradox considers the statement that people of media studies cannot think about media studies. This paradox is based on the assumption that in order to protect a particular media theoretical approach, one has to protect the disciplines from which it departed. And third, the idea that German media studies is an unproblematic field of study or branch of knowledge. However, media studies exist in a sphere of contention; its heterogeneity soils the gaps between media studies and communication and/or film studies. What Pais sought to demonstrate is that the recent debates on ‘Germanness’ are the results of German history, and that ‘there is no German media theory, but only a history of media disciplines’. He, however, takes no notice that his third paradox not only fits the German history of media studies, but also that of the French (and possibly that of other countries). To complete this second day of conference, Joachim Paech (Constance) articulated a cultural-historical account of German Medienwissenschaft from the 60’s to the 70’s. And he did it in style, in German. He argued that since the 60’s the distribution and production of films (through digital technology, the speed of distribution, and the change in accessibility) has changed. This in turn not only affects how films are viewed, but also changed cinematographic aesthetics. By zooming in on the movement of perceptual positions of modernity, Paech’s presentation furnished as a harmonious bridge between the theoretical and experiential part of this day. This experiential part refers a photographic exhibition of Harald Hauswald and a screening of Marc Thümmler’s ‘Radfahrer’. Subsequent to the theoretical presentations, this experiential part offered new food for thought for the final day of ‘Media Theory on the Move’. Jeremy Shapiro (New York) opened the third and last conference day with his presentation on the social and psychological impacts of new media and technologies, in particular on the effects of social networking. He posed a critical and ethical perspective for the study of media sociology based on Schopenhauer’s principle of imbalance. This perspective offered a way out of the ‘exaggerated myths of pleasure and desire’ (i.e., prejudice assumptions derived from the study of previous media) by considering suffering, or torture, as its object of study. Shapiro argued that social networking converge overstimulation and noise via the accumulation of social capital. It reconceptualizes communication as control through an increase in horizontal social control and surveillance. Understanding social networking as torture, Shapiro maintained, provides the means to grasp to what extent social networking is the socialization of global information capitalism. Drawing on her ethnographic study of the Princeton Radio Research Project, Irmela Schneider (Cologne) argued that media theory is problematic because it juggles with two philosophies of sowing: dissemination and statistics. She, however, rejects the statistical perspective and denounced it as an unnatural epistemological frame that portrays an idealized, imaginary and coherent society. For Schneider, statistics is not a paradigm but an empirical technique to maintain contingency. Whereas Schneider explored the movement of contingency, Richard Cavell (Vancouver) examined motion through the concept of speed in the work of Marshall McLuhan. McLuhanesque speed refers to the desire for the new, and his concept of motion refers to embodied movements in time. According to Cavell, McLuhan was a theorist of embodiment whose sensory phenomenological approach rejected the linguistic metaphor. He called attention to the dominant position of motion (and e-motion) in McLuhan’s work with the concept of biomediation. Biomediation delineates ‘the mediation of the body’; it is a bio-technical embodied movement that flows across the gaps of body and media. This concept, Cavell argued, accentuates the dynamics and prostheticity of McLuhanesque motion. The last speaker, Nikolaus Wegmann (Princeton), took a rather challenging position by stating that media studies have recreated the canon. He supported his argument by stating that the negative definition of the canon as epistemological structure is a matter of education and teaching. To illustrate, Wegmann argued that the focus on theory of German media philosophy sought to establish media as an autonomous field of study. By cherishing a disciplinary autonomy, media studies reinstate a negative definition of the canon. To construct a positive rather than a negative definition of the canon, Wegmann characterized the canon as temporality that is systematically formulated in time. The canon then emerges as a ‘matter of local exchange’. He concluded by stressing that media studies should construct anachronisms of the canon (i.e., the canon should be mobilized) to understand the value of knowledge. A quite passionate discussion followed. To conclude, Dieter Mersch bid everyone farewell in his epilogue ‘Trip to Lemos’. He reflected on the wealth of issues that emerged during the discussion sections and concluded that understanding the movements of media theory remains one of the main challenges for media theorists today. In the end, this all-encompassing conference elucidated what seems to me to be the charms of media philosophy: heterogeneity and diversity. The event even exceeded its title by questioning the movement of media theory on the move. The fluidization of the transatlantic movements of thought is on it way.